I was fifteen when I had my first encounter with food addiction: a friend of mine explained that she would eat uncontrollably, then throw it up so she wouldn’t gain weight. She said she couldn’t stop eating, and she’d eat in secret before going to vomit in the toilet. As we got older, she said she wasn’t bingeing anymore, but that was only because she felt such guilt and shame for what she was doing. Ten years later, and she still hasn’t gotten over her eating disorder. Stories like that of my friend aren’t uncommon. An integral part of our social lives, food is a way to connect people and cultures through the exchange of a meal. It’s the best part of family time at home, and how we can express our love for tradition. However, since it has become such a predominant element of the human experience, it’s also unavoidable. People with food addiction, like my friend, and so many others, can’t escape the reality of being confronted with food every day. When you’re a person experiencing this reality, and trying to handle the guilt of eating too much, the shame of hiding your addiction, and the impact on your health, it can feel overwhelming and lonely. However, there is help, and the good news is you don’t have to do it all by yourself. 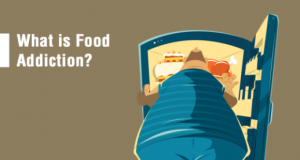 In order to start combating your food addiction, it’s important to understand what it is. 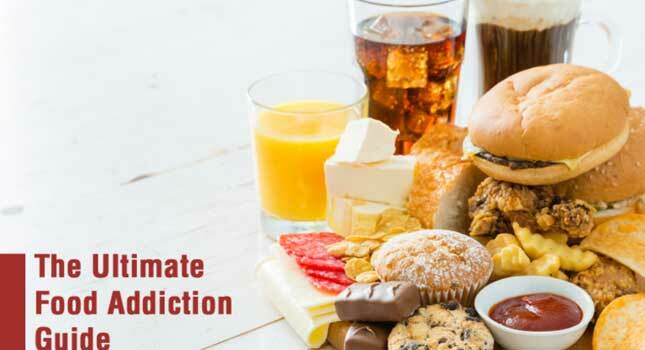 Food addiction is a behavioural addiction that is characterized by the compulsive overconsumption of foods that are particularly high in fats, sugars, and salts. 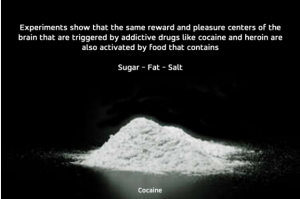 Such substances trigger the brain’s pleasure centers by engaging in a similar was to drug and alcohol addiction. When these pleasure centers are triggered, impacted individuals become addicted to the good feelings associated with the consumption of fatty junk foods. As such, they will continue eating these foods despite feeling full, so as to prolong that feeling of pleasure. Food addiction can lead to weight gain and obesity, but also responses like bulimic bingeing and purging. The fixation on food leads to unhealthy coping mechanisms for dealing with the guilt associated with an eating binder. That’s why we’re here to help. One of the hardest parts of living with food addiction is dealing with the isolation created by secrecy and shame. However, you aren’t going through these feelings alone. Recent statistics state that between 1980 and 2008, the worldwide obesity issue has nearly doubled. 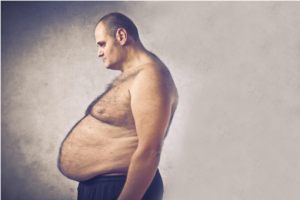 Currently, of the adult population above 20 years old, half a billion of them are obese. And while the worldwide population continues to trend towards obesity, Saudi Arabia ranks 29 on a list from 2007 of the world’s fattest countries. 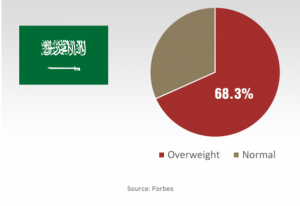 68.3% of the Saudi population is overweight, meaning that the many other Saudis are facing food addiction issues. 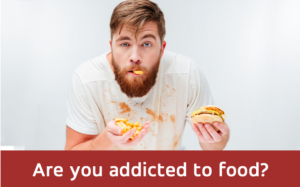 So How Do You Know if You Have Food Addiction? 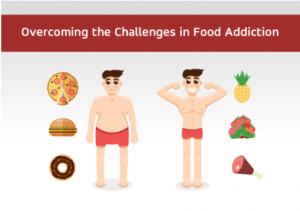 There are many different signs of food addiction, as symptoms manifest in physical, social, and psychological ways. Due to the complexities of side effects from uncontrollable binge eating patterns, many food addicts experience deteriorated quality of life. Below are some of the symptoms associated with food addiction and how you can spot the signs in yourself, or a loved one. Inability to control cravings for certain foods once you start eating them? Do you frequently overeat to the point of feeling ill? Are your thoughts constantly preoccupied by food? Have you resorted to drastic measures to avoid weight gain? Are there certain foods you feel the need to eat more of in order to be satisfied? Are you continuing the disordered eating behavior despite negative consequences? Do you feel ashamed, helpless, or depressed when you binge eat? When you’re upset, do you cope with food? When you’re rewarding yourself, do you use food? Do you secretly eat so nobody knows how much food you’re consuming? When you’re invited to social gatherings, do you look forward to the food more than the company? Do you steal other’s food? However, the social and emotional ramifications can sometimes be even more severe, as food addiction can lead to depression and suicidal thoughts. Other impacts include lack of interest in work or school, leading to decreased performance; feelings of guilt, shame, and hopelessness; and a tendency to isolate oneself from friends and relatives, particularly during social situations. 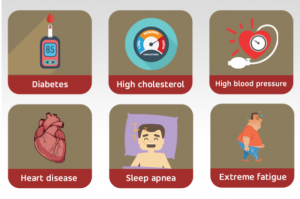 The physical and emotional effects of food addiction are quite serious, and without treatment can lead to a severely reduced quality of life and relationships. As isolating as it may feel to be suffering from food addiction, there is treatment available. 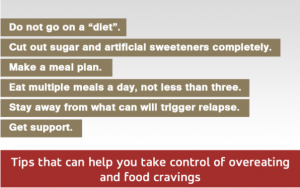 Once you have been diagnosed with food addiction, it’s all about creating an action plan to help get you life back on track. Since sugars, fats, and salts are the triggers for the psychological need to binge eat, it’s essential that you start with cutting them from your diet. Then you need to make changes to the way that you eat, starting with creating a healthy meal plan that doesn’t make you feel like you’re on a diet. However, you should eat multiple meals a day so as to avoid the desire to eat massive quantities at one time. Finally, you need to seek support with your recovery. This includes reaching out to friends and family and being open about your condition, and the fact that you need extra support during this time. Seeking professional help is always a good idea, as the guidance will help keep you on track and responsible to yourself. There will be bumps in the road during your recovery. Not only is food addiction a pattern of behaviour learned over years, but it is also a psychological condition like any other condition. As with any other recovery process, you will have good, empowering days, and tough days. However, the important thing is that you’ve taken the first steps toward improving your life and moving forward. Overcoming food addiction is not a one day event- it’s a process. It’s important to look at the challenges as tests. Failing the test doesn’t mean you can’t take it again. It just means you weren’t ready. Over time, the more tests you face and the more times you overcome, your recovery will feel much more stable. One of the biggest challenges of the recovery process in relapse. While it’s frustrating to experience a setback like this, there are often a variety of reasons individuals fall back into old habits. For instance, many food addicts find transitioning back into their social lives difficult, or being in an environment with lots of food. Alternatively, they might have a fear of failing, and relapse from pressure. The important thing to remember is that you can always get back on track in your recovery. In addition to relapse, there are many other challenges you have to be prepared to face during recovery. First, you’ll have to develop new coping mechanisms for when you feel the need to binge eat, such as avoiding temptation and eating on a regular schedule. Additionally, developing coping mechanisms to deal with the emotions that instigate binge eating, like anxiety, depression, and loneliness. Things like keeping track of what you eat, identifying which foods trigger your binge behaviour, and recognizing the emotions that lead to a binge can all help as coping mechanisms. There’s also the transition from rehab back home, when you have to rebuild broken relationships. This can be an emotionally trying time, but connecting with others can be an extremely helpful way to create emotional support and eliminate boredom. Remember, it won’t happen overnight, but with time, you’ll find the people in your life to be supportive and kind. After you have come to terms with the fact that you have a food addiction disorder, seeking professional help can be the best way to jumpstart your recovery. 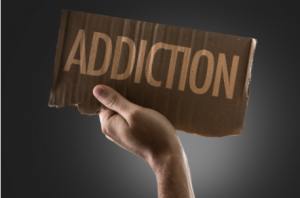 It’s important to find a space where you are safe and supported, where you can be taught tools to manage your addiction, learn more about recovery and the aftermath of addiction, and ultimately begin the healing process. That’s where The Cabin can help you. With specialists in food addiction, we want to give you the tools you need for a successful, sustainable recovery. Visit us in Chiang Mai and get started beating your food addiction today.